Staples QB Jack Massie in action as Staples High School hosts West Haven in a Class LL football quarterfinals game in Westport, Conn., Nov. 27, 1012. WESTPORT -- Another week, another opponent, same old story. After steamrolling through the FCIAC en route to its second straight conference title, Staples High opened the Class LL state playoffs on Tuesday with yet another display of offensive fireworks. The top-seeded Wreckers gashed No. 8 West Haven's defense nearly every way possible, racking up 28 first-quarter points in a 42-20 dismantling of the Blue Devils. Wide receiver James Frusciante hauled in a 60-yard touchdown from Jack Massie to put Staples up 7-0 just eight seconds in, and the offense heated up from there. The Wreckers found the end zone on four of their first six plays from scrimmage and gained 255 yards in the first quarter alone. "We wanted to come out with a balanced attack," said Frusciante, who ended the evening with four catches for 161 yards and three touchdowns. "The passing game and run game worked well together. They worked off each other. The offense was really clicking tonight." 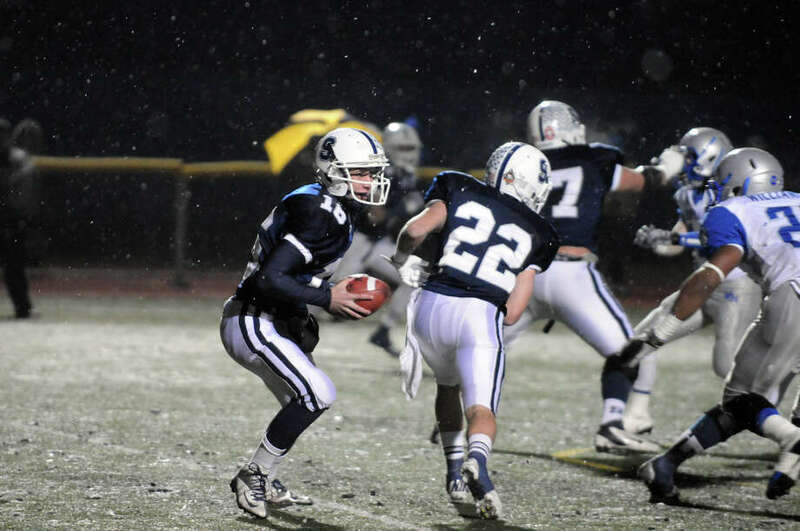 Staples, which came off a 48-30 thumping of Greenwich in the FCIAC championship game on Thanksgiving, moved to 10-0 and advanced to the semifinal round on Sunday. The Wreckers will face the winner of Wednesday's quarterfinal between No. 4 Newtown (10-0) and No. 5 Norwich Free Academy (10-0) at a time and site to be determined. The Wreckers broke out their full assortment of weapons on offense in the first half and piled up 386 yards, scoring five touchdowns on their first 19 plays. Running back Joey Zelkowitz gained 83 yards on five carries and scored two touchdowns--the last of which capped a 13-play, 86-yard drive and gave Staples a 35-0 lead heading into halftime. "We came out fired up," Frusciante said. "I think we were really ready to go for this game. The offense came out fired up and the defense was lights out in the first half." West Haven (8-3) came into the game averaging 36 points a game, but was missing a key part of its option offense, starting quarterback Javon Taylor (shoulder injury). The Blue Devils relied heavily on running back Ervin Phillips, who gained 73 yards on nine carries in the first half, with 52 of those yards on one play. "Javon couldn't play. He couldn't throw the ball and he couldn't get his handoffs, so we tried to get cute with Ervin," West Haven head coach Ed McCarthy said. "Our problems weren't really on offense in the first quarter." The Blue Devils moved the ball at times, but failed to finish off their drives. Trailing 7-0, they moved the ball down to Staples' 8-yard line on their first possession with eight straight runs before stalling on fourth-and-7. "We had to put in a new offense in two days," McCarthy said. Phillips' 6-yard run put West Haven on the board with 3:49 left in the third quarter and cut Staples' lead to 35-6. The junior back ended the evening with 125 yards on 21 carries, and threw two late touchdown passes of 29 and 15 yards to running back Duane Gary. "Our goal was to try and stop (Phillips)," Staples head coach Marce Petroccio said. "I think overall we did a pretty good job of it tonight." Frusciante hauled in a 41-yard strike from Massie early in the fourth quarter to cap the scoring for the Wreckers. Staples running back Nick Kelly gained 123 yards on six carries and scored on a 92-yard run in the first half. Kelly, however, left the game in the third quarter with an apparent shoulder injury and did not return. Records: West Haven 8-3; Staples 10-0.